Some days, a girl just needs her mac. I’d had a long day at work and there was nothing in the fridge, and our favorite comfort food was on my mind. 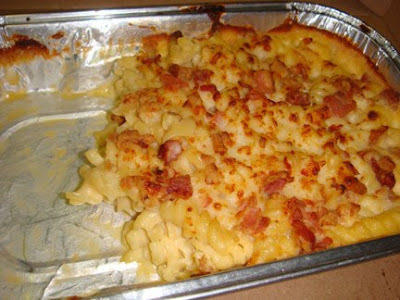 So I took a leap of faith and dialed Pizza Hut to have their Premium Bacon Macaroni and Cheese delivered to my doorstep. It arrived in about 40 minutes, still hot. A typical cardboard pizza box cradled the disposable pan of macaroni and cheese, with a paper bag of breadsticks nestled alongside. It looks pretty in the pan, the top apparently having been browned for a few minutes in the pizza oven. I got a half-order of the pasta for $7.99 and I believe it could serve two adults and a kid if you added a salad or something (a pizza, perhaps?). The half-order pan measures 5” by 9” so I’m guessing a full-size pan is a 9” square. Keep in mind that these pans fit inside a pizza box so they are quite shallow. Even so, I must admit that this dish represents a decent value. A full order goes for $12.99 and in all honesty I don’t think any of the homemade macs I have prepared for this blog have rung up anywhere near as low as that price, cheese being the primary cost driver. And there I’ve hit upon the secret to keeping mac prices down. Fortunately or unfortunately, I don’t think there is any actual cheese in Pizza Hut’s “Premium” Bacon Macaroni & Cheese. Is there a white, food-service-only version of Velveeta out there somewhere? Because that’s what this seemed like. It had a good ratio of noodle-to-sauce, but I could not identify the flavor of any particular cheese variety, and the sauce was homogeneous to a worrisome degree. My guess is that it comes out of a can from Pizza Hut HQ. It’s initially pleasant enough, but after a few bites you notice a certain…plasticity is the word that comes to mind. The “premium” bacon is the best tasting part of this dish, but there’s very little of it. It is thick-cut and agreeably salty, but it was only sprinkled on top of the mac, not mixed in, and all the little chunks probably amounted to less than one full strip. I suppose the fact that it is only sprinkled on top would be a bonus for purists who do not like bacon in their mac – you might be able to order it sans bacon. But by doing so, you’d remove nearly all the flavor from this dish. The pasta is a corkscrew shape, possibly a fusilli, and it does a good job of holding onto the sauce, such as it is. To my surprise, the noodles were cooked to the perfect degree. Honestly, I can imagine plenty of people liking this mac, and I think the bland flavor and consistency would go over well with kids and other picky eaters. But if you are a worldly macaroni and cheese adventurer like me, unless you are a completist you may prefer to skip this offering, convenient though it may be. You’re welcome. Pizza hut has been expanding its products and outlets for the satisfaction of the visitors. All the qualitative products have been ensured for the happiness and quality of the product in front of the visitors.